The Dome Home is a structure I came across in a photo a few years back and it immediately peaked my interest. 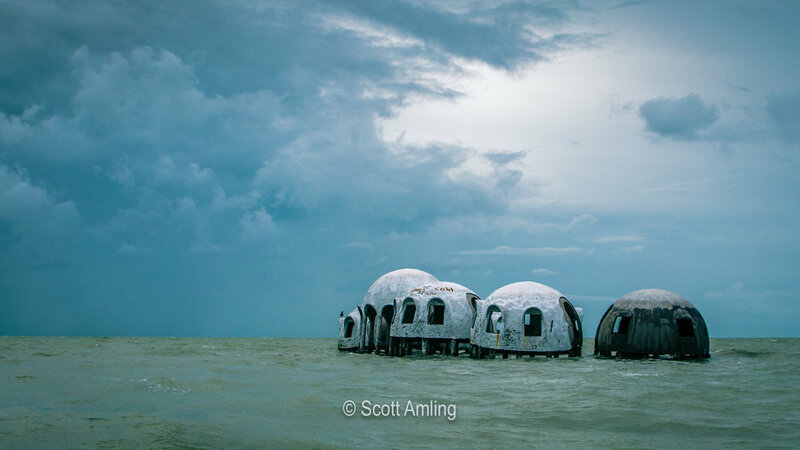 The now abandoned home is located near Cape Romano and south of Marco Island on the west of Florida. Constructed in 1980 by former business man and oil tycoon, Bob Lee, the structure is six interconnected dome structures, some of which have two levels, secured on stilts. Lee envisioned creating a fully self-sufficient home, able to collect rainwater, featuring solar panels with a battery system for power. However, several hurricanes and severe weather conditions have eroded the land around the dwelling and the remnants of the structure are now approximately 180 feet offshore. It is this isolation in the water that helped create an interesting subject to photograph. I traveled to Miami and headed west through “Alligator Alley” towards Marco Island. There, I hopped on a boat to visit the Dome House site. Now, as I have mentioned before in previous blogs, landscape photography is a balanced combination of weather, luck and talent. In order to make this specific opportunity work, I needed the first two elements to work in my favor. Also, given the fact that I had to take a small boat out to the location, I needed to find the perfect experienced boat captain. Captain Jesse was that last piece of the puzzle. About halfway out to the Dome Home, Jesse’s wife texted him and was not happy to hear that he was out in the conditions with a customer. Text from Captain Jessie prior to heading out to the Dome Home location. Weather is typically a necessity in my photography, but, too much of it can be a bad thing. In this case, I just so happened to be on Marco Island the weekend of Hurricane Harvey. This location is on the tip of West Florida on the inside of the Gulf of Mexico where the outside cells of the Hurricane Harvey were creating a lot of wind and rain. Luck certainly played its part when I picked the correct, experienced boat operator as we were the only two people out on Cape Romano that late afternoon. The mysterious quality of this shot is due to the weather conditions which helped create the eerie environment locals describe about it. Some of my photography excursions are more about the technical side of things; this particular time it was about getting lucky with the right boat captain and weather.